You can Tribute 1 monster; inflict 500 damage to your opponent. This monster appears in the artworks of Autonomous Action Unit, Blasting Fuse, Covering Fire, Divine Wrath, Linear Accelerator Cannon, Mass Driver, Transmodify, and Fuse Line. 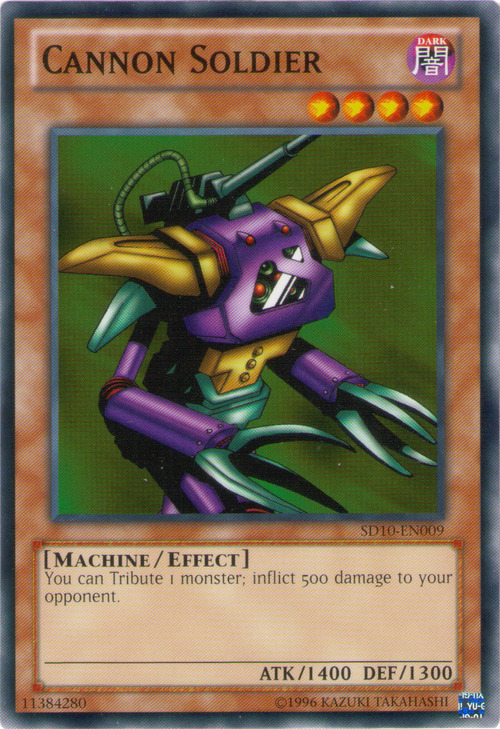 This monster has a Toon monster counterpart: Toon Cannon Soldier. This monster has an upgraded version: Cannon Soldier MK-2. Based on the artwork of Transmodify, Cannon Soldier is within Cannon Soldier MK-2. The former is most likely controlling the latter. Barrel Behind the Door: You can activate "Barrel Behind the Door" against Ignition Effects like "Cannon Soldier", . Enemy Controller: When the Ignition Effect of "Cannon Soldier" or "Chaos Emperor Dragon - Envoy of the End" is activated, and you chain "Enemy Controller" to take control of the "Cannon Soldier"/"Chaos Emperor Dragon - Envoy of the End", even if you take control of the monster, you cannot take control of the effect itself. So if your opponent activates "Cannon Soldier" or "Chaos Emperor Dragon - Envoy of the End's" effect, and you chain "Enemy Controller", you still take the damage from "Cannon Soldier"/"Chaos Emperor Dragon - Envoy of the End". Mage Power: If you control "Cannon Soldier" equipped with "Mage Power", and you activate "Limiter Removal", then the ATK of "Cannon Soldier" is (1400 + 500 + 500) x 2 = 4800. 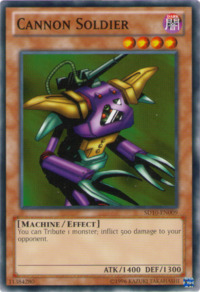 Mask of Restrict: If "Mask of Restrict" is chained to the effect of "Cannon Soldier" you will still take damage because Tributing a monster is a cost of "Cannon Soldier" and is performed when the effect of "Cannon Soldier" is activated. .
Mokey Mokey King: Missing the timing: If "Mokey Mokey King" leaves the field in the middle of a chain (for example, if destroyed by "Ring of Destruction" chained to "Pot of Greed", or Tributed for a Tribute Summon or for the effect of "Cannon Soldier", etc.,), you miss the timing and you cannot Special Summon. Only when the last action of the chain is the removal of "Mokey Mokey King" from the field, can you activate it's effect. Peten the Dark Clown: If "Peten the Dark Clown" is Tributed for "Mystik Wok" or "Cannon Soldier", the last thing that happened was that those effects resolved, so the effect of "Peten" does not activate. Pinch Hopper: Missing the timing: Because the effect of "Pinch Hopper" effect is an optional "when you can" Trigger Effect, "Pinch Hopper" being sent to the Graveyard has to be the very last thing that happened in order for you to activate its effect. Also, if you Tribute "Pinch Hopper" for "Cannon Soldier", the very last thing that happened will be the 500 points of damage inflicted to your opponent, so the effect of "Pinch Hopper" will not activate. Skill Drain: "Skill Drain" does not stop you from activating Ignition Effects, but it does negate their effects as long as the Effect Monster remains on the field. If you Tribute "Cannon Soldier" to itself while "Skill Drain" is active, "Cannon Soldier's" effect is not negated because "Cannon Soldier" is in the Graveyard, but if you Tribute a different monster for "Cannon Soldier's" effect, then the effect is negated and your opponent takes no damage. . Soul Exchange: You can Tribute the targeted monster for any card that requires a Tribute, or for a Tribute Summon. So you could Tribute it for the effect of "Cannon Soldier", . Soul Exchange: “Soul Exchange” does NOT give you control of your opponent’s monster, so you can use “Soul Exchange” combined with your “Cannon Soldier’s” effect even if you already have 5 monsters in your Monster Card Zone.